This is not intended to satiate DB5 fans because it costs a substantial amount more than a real DB5. Ten points to you if you’re enough of a nerd to know that the initials to the name David Brown are inscribed into every Aston Martin that has it’s model name start with a DB. Named after the post war savior of Aston Martin, DB branded cars helped propel the brand forward using righteously beautiful design. Of the series, the DB5 is arguably the most well-known, and for all of the aspiring collectors aching to have one in their garage, bespoke automaker David Brown Automotive has the solution. This car, named the David Brown Speedback GT, takes just about every styling cue from the DB5 and modernizes it. It won’t fully quench the appetite of an Aston Martin lover mainly because it has no connection to Aston Martin except for the fact that it loosely borrows its design and takes the name of its previous owner. 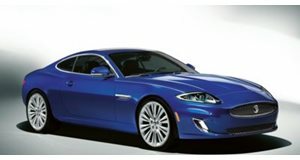 It’s even based on the bones of the discontinued Jaguar XK and borrows its supercharged 5.0-liter V8. Thankfully the power output gets preserved because 510 horsepower and 625 lb-ft of torque is enough to make good use of what amounts to 3,960 pounds (when dry) of retro-inspired modernity. That’s enough grunt to propel it from 0-62 mph in 4.8 seconds before topping out at 155 mph. When speed isn’t in demand, both driver and passenger can sit back and enjoy the scenery while stationary thanks to a rear seat that’s stowed under the long rear hatch. Things get spruced up a bit over the Jaguar XK on the inside but much of the dash is reminiscent of the donor car. That’d be all good and well for a relatively cheap performance car, but the David Brown Speedback GT stickers for nothing less than $602,316. At least buyers know they will be part of an exclusive group of only 100 owners, but the high price is almost counter intuitive because an actual Aston Martin DB5 can be had for $450,000. Given that the David Brown Speedback GT is technically a Jaguar, don’t expect it to be more reliable than the old DB5 either.